In today's highly regulated, highly networked international work environment, messaging security is vital both to protect the organization's sensitive information and to comply with business regulations such as the Sarbanes-Oxley Act (SOX) and the Health Insurance Portability and Accountability Act (HIPAA) in the U.S. and various data privacy regulations abroad. 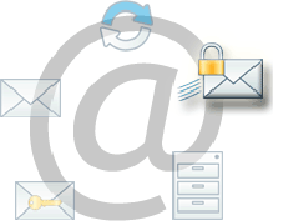 In regards to comply with the laws and messaging security, e-mail messages and attachments containing sensitive information must be encrypted during transmission and on e-mail servers, particularly when they are sent outside the corporate firewalls. E-Lock has the modular approach, which helps to integrate the messaging security solution in the present application without disturbing the workflow. Also the E-Lock solutions are compliant with the laws like HIPAA, SOX, GPEA and JITC, which enables the organizations to implement the messaging security that manages the email security policy, and are compliant with the requirements in financial services, health care and public sector. Presently ABN AMRO uses the messaging security solution provided by E-Lock Technologies. The email messages are digitally signed to authenticate the data, which are then encrypted and zipped and directly send via email to the recipients assuring the message is intact, secure and authenticated.